Horseback Riding Tours in Costa Rica? Try Rancho Savegre and Gallop the Beach of your Dreams! 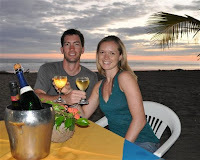 There are so many great tours in the Manuel Antonio/Quepos area of Costa Rica, that I periodically like to share some of my favorites with my blogging friends. This month I have chosen to feature the horseback riding tours offered by Rancho Savegre Tours, located just North of Quepos in beautiful Esterillos, Costa Rica. farm, the benefit of living near a popular tourism area allowed Diego to start his own business, sharing his extensive horse skills and knowledge by offering ecologically sound horse tours along the beaches and jungles of the spectacular Pacific Coast of Costa Rica. Though still actively teaching part-time classes in economics to students in Costa Rica, Diego spends most of his time tending to his own horse farm and it’s many equine (and other) inhabitants. Diego and his staff of talented equine tour guides take pride in carefully tending to every detail of your horseback riding adventure, ensuring an unforgettable vacation horse experience for visitors from around the world. Their stable of well cared for and beautiful professionally trained horses are perfectly schooled to accommodate all levels of horseback riding experience. Careful attention is given to not only the health and condition of the horses, but the riding equipment, extensive trail systems and typical Costa Rican meals offered during your customized horseback riding excursion. 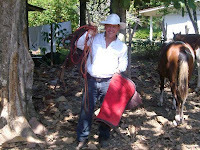 Diego has actively promoted many horse, cowboy, parade and rodeo events throughout Costa Rica for many years, raising funds for numerous charitable causes, entertaining at local community events and eventually enjoying mentions in several prestigious magazines who came to recognize the high quality and uniqueness of his many horse endeavors. 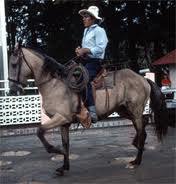 Having professionally trained horses for the National Iberoamerican Breed Horse Cup, Diego also promotes the Costa Rican Criollo horse breed (the most common Costa Rican Horse Breed) via his horseback riding tours, sales, breeding and general promotion of this hearty little breed of horse at the many events he attends. races, making it an excellent breed for endurance competitions that can last over a week in duration and allowing no supplemental feed or performance enhancing drugs during the competition. The breed is very well known for its hardiness and stamina, as well as it’s ability to live in extremely challenging conditions of harsh weather, low feed quality, lack of water and areas with common parasite and tick infestations that would negatively effect most other horse breeds. It’s resistence to harsh conditions makes it the perfect breed for the harsh tropical conditions found in Costa Rica. The word Criollo originally referred to human and animals of pure-bred Spanish ancestry that were born in the Americas. Over time, the meaning of the word came to simply refer to all native breeds of the Americas. The Criollo in the equine world is typically a small, hardy horse with a brawny and strong body, broad chest and well-sprung ribs. They have sloping strong shoulders with muscular necks, short and strong legs with good bone structure and resistant joints, low-set hocks and sound hard feet that hold up to both marshy ground or the rocky hard ground commonly found throughout Costa Rica. The medium to large size long-muzzled head has a straight or slightly convex profile with wide-set intelligent eyes. The croup or withers are sloping, the haunches well-muscled, and the back is fairly short with strong loins. The Criollo is considered an intelligent, willing and sensible mount, averaging a meager 14.3 hands high, with a maximum height for the males of around 15 hands. Today, the horse is used mainly as a working-cow horse, but it is also considered an excellent choice for pleasure and trail horses, and they are also considered excellent for rodeo and endurance competitions. 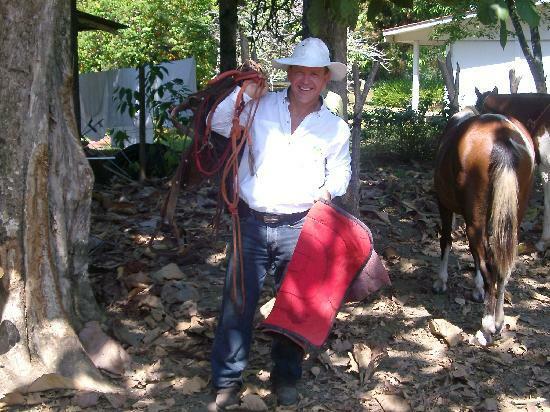 Diego Solis welcomes you to enjoy all of Costa Rica’s Nature Experiences on the Rancho Savegre Horse Tours and hopes you will choose to visit his own little piece of Paradise along the beaches and mountains of Monterey de Esterillos. Each tour is customized based on the requirements of the individual riders. Detailed riding instructions are carefully explained for each level of riders experience, and each tour offers a bilingual guide to help you enjoy your tour to the fullest. Your outing includes a delicious traditional Costa Rican meal prepared in a “typical” Costa Rica setting and prepared in the old style Costa Rican traditions. Tour sizes are purposely kept small with a maximum 10 people (usually less) assuring your safety and personal attention throughout the ride. Offering mountain rides, isolated beach tours, or a combination of both, Diego has recently added a special tour designed just for Honeymooners or those looking to have a special romantic equine adventure. river. Hikers enjoy a beautiful tropical forest and crossing cattle fields while learning about the flora, fauna and cattle industry in Costa Rica. It is an easy ½ mile walk. Tennis shoes or hiking boots are a must. Important: Bring a swim suit. The natural ponds are a great place to swim! Departure 11:00 am, minimum of 2 persons, transportation, fruits, water, and entrance fee to waterfalls included. way to arriving at our isolated beach destination, the almost completely deserted black sand beach of Esterillos. Known for rare Scarlet Macaw sightings, this beautiful wide beach has been awarded the coveted Blue Flag, which honors Costa Rican beaches that have passed strict ecological standards. This area serves as the perfect backdrop to gallop freely along the warm waters of the Pacific shoreline. Riding time: Approx 2 hours. Lunch, transportation, fruit and water is included. 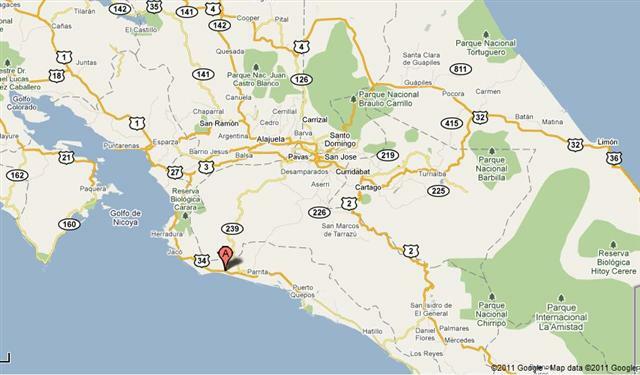 Monterey, approximately 20 minutes south of Jaco and 40 minutes North of Quepos. The ride begins crossing through cattle fields along forested back roads on wide safe trails revealing spectacular ocean and mountain views along the way and offering many opportunities to gallop for the more experienced riders. Sightings of local deer, monkeys and the colorful Scarlet Macaws are not unusual as well as other wildlife and birds. As we cross small rivers and creeks, guests come upon more impressive forested vistas and then the ride descends down the rolling hills eventually arriving at beautiful Esterillos Beach. This pristine black and white sand beach is almost always completely deserted, making galloping along the shoreline one of the highlights of this horseback riding adventure. Guests will enjoy the lush vegetation and small mangrove estuaries that line this isolated beach. The trails on this tour are easy to navigate for both beginner and advanced riders on our well trained horses. Riding time: 2 ½ -3 hours. Lunch, transportation, water and fruit are included. Sunset Ride with wine and special snacks, followed by a bonfire at the beach. Below are some pictures of one such ride, the honeymooners comment was, “It is the most memorable part of our wedding and honeymoon”. Discuss your plans with Diego and he will set up a custom event that you will remember for the rest of your life. Tour operates depending on season and weather conditions. For all tours: Pictures and videos are available at the end of your ride, so your memories will last a lifetime! Rancho Savegre is truly one of the premier horseback riding tours available in Costa Rica, and is a very popular tour recommended by area Costa Rica Hotels. Offering quality horses, fabulous deserted beaches, lush rainforest and mountain locations all with the added benefit of being conducted by professional riders/guides in small private riding groups. As a champion horseback rider and trainer myself, I can personally highly recommend this tour to other riders no matter whether they are young or old, beginner or experienced, those who are looking to truly experience the wonders of Costa Rica while enjoying the unique companionship that horseback riding offers will love this tour. For those interested, feel free to contact Diego with any questions you may have or you can reserve by emailing ridingadventure@gmail.com or at info@costaricahorsevacation.com.